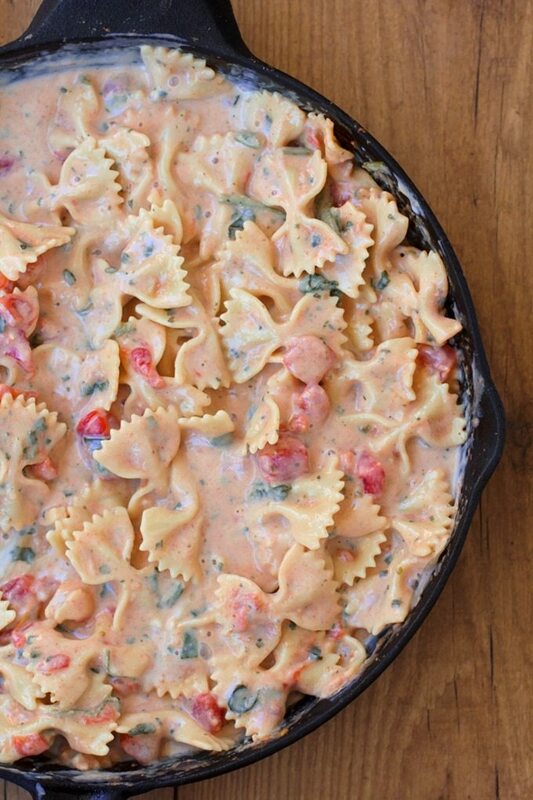 Creamy Spinach Tomato Pasta - Ready In 20 Minutes! 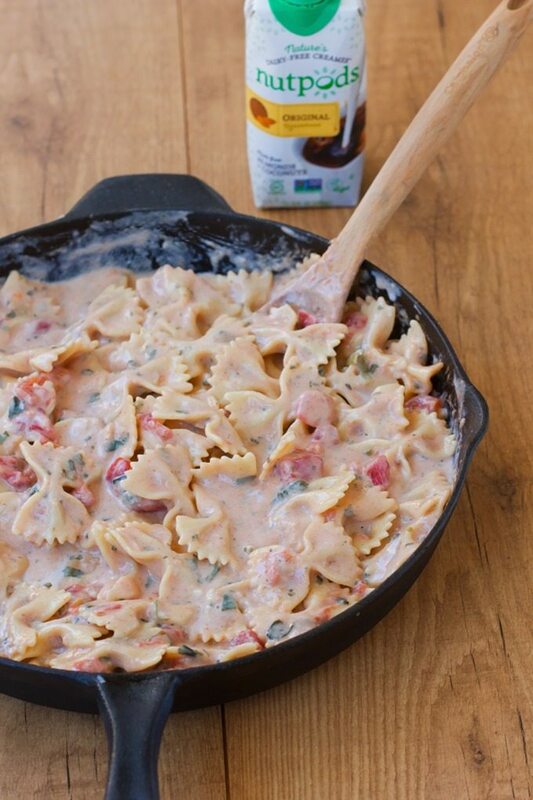 This ultra creamy homemade pasta dish comes together in just 20 minutes – and with only one pot to clean! 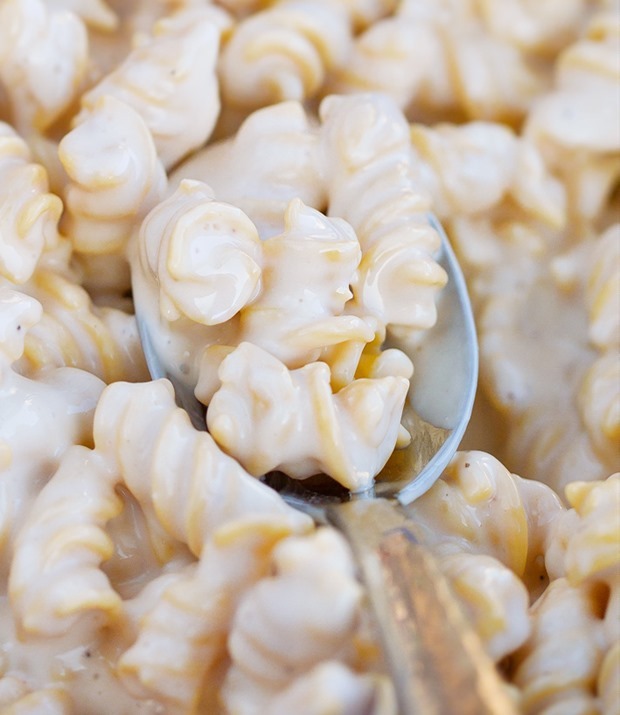 The sauce is so thick and creamy – even without ANY heavy cream! Something you might not know about me is that I am a huge hockey fan – Seriously, ask me any sort of useless hockey trivia and I will probably know the answer without even having to stop and think. Come playoff season, you can find me with eyes glued to the television and remote in hand, especially if my team has a chance to win. I’m lucky enough to have my two favorite teams in the playoffs this year (Dallas Stars and Washington Capitals), which makes for one very happy Katie. 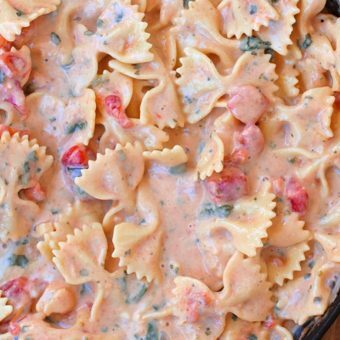 I quickly threw together this creamy tomato pasta dish on Monday night as a simple and filling meal I could enjoy before watching the games. With just one skillet and no need to chop any vegetables or blend ingredients, I made myself a leisurely dinner and cleaned the entire kitchen, all before 7 PM. For dessert, try these Vegan Chocolate Chip Cookies or these Black Bean Brownies! Cook the pasta according to package directions, in salted boiling water. While the pasta cooks, sauté the garlic for 1 minute, then add the flour, onion powder, and salt. Whisk in remaining sauce ingredients and bring to a boil, whisking constantly. Add the pasta and stir to coat. Taste, and season with salt and pepper if desired. 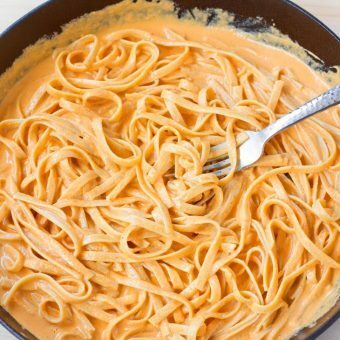 If the pasta absorbs the sauce and looks a little dry, stir in a little more milk of choice until sauce is creamy again. The first option is to use cashew cream. If you haven’t tried my recipe for Homemade Cashew Cream yet, you should definitely check that one out at some point – It’s incredibly versatile and can be used to add richness and creaminess to both sweet and savory dishes, for a fraction of the calories in heavy cream! The other option, which I tried out on Monday night, is to use unsweetened creamer or a half-&-half-type product. I was recently introduced to Nutpods Dairy-Free Creamer, and I was head-over-slippers in love at first taste of the thick vegan creamer. Immediately upon receiving the package, I tried it straight from the bottle… and I can’t say that was the only time I drank it straight from the bottle, either. The creaminess is just too hard to resist! Yes, I was the girl who would drink heavy cream straight from the carton as a child whenever my mom would make homemade whipped cream. She’d turn around, and half the heavy cream container would have disappeared. If this were an iphone, I’d insert the embarrassed emoji now. Bring a salted pot of water to a boil. 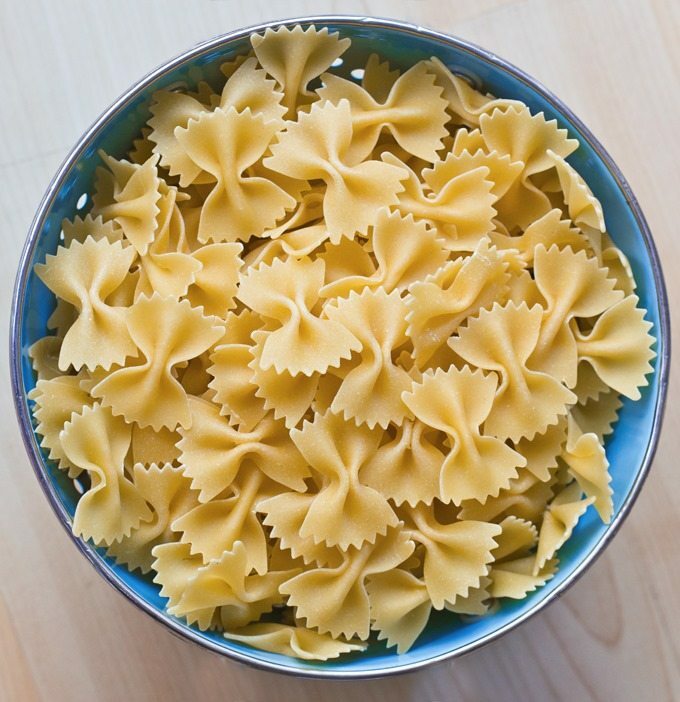 Boil pasta according to package directions, then drain fully but do not rinse. Meanwhile, sauté the garlic in the oil for 1 minute. (Technically, you can use oil spray, but the oil will give a richer flavor and will help the sauce adhere to the pasta – It amounts to less than a teaspoon per serving, and I really think the flavor will be much better if you use oil instead of spray.) Add the flour, onion powder, and salt. Sauté an additional minute, then whisk in the creamer, milk, oregano, and Parmesan, if using. Bring to a boil, whisking constantly. Boil and whisk for about a minute, then add the tomato and spinach – You can omit the spinach if desired. Stir until sauce thickens. Add the pasta and stir to coat. Season with salt and pepper if desired. 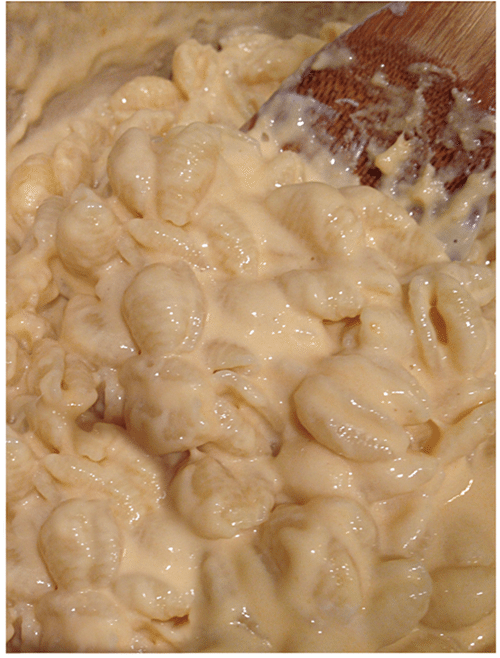 If the pasta absorbs the sauce and looks dry, stir in a little more milk of choice until sauce is creamy again. This sounds so yummy, Katie! 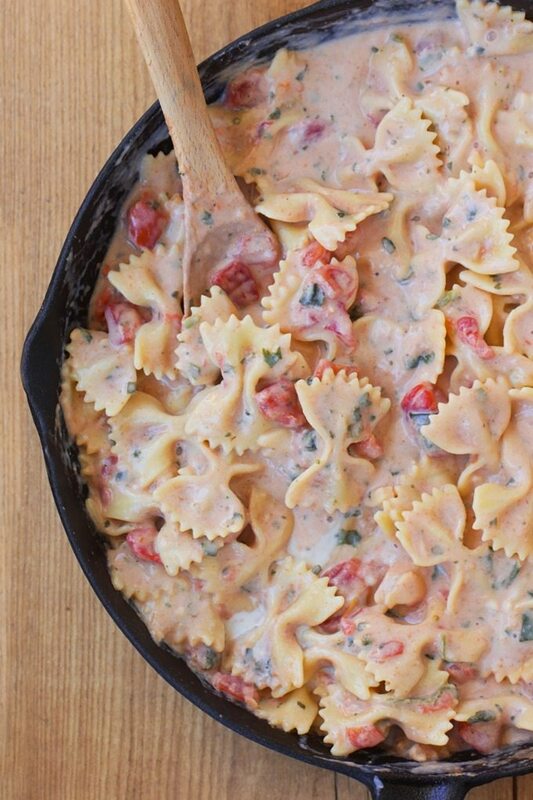 I love creamy tomato sauce – pinned! Mmm pasta…This look very simple and tasty! Btw, and I’m not trying to point fingers, but you called the creamer “nudpods” in one part of the post and “nutpods” in another. 🙂 It’s actually “nut,” right? Just checking. Thank you for pointing that out! Fixed! I’m so excited to try this!! Could I replace the cream with milk? Also the pictures are stunning. I cannot believe how CREAMY the recipe looks! Making this for sure. And your photos alone have sold me on the vegan creamer, which I’ve never seen before. I just put it on the grocery list for my next Whole Foods run! This looks amazing! I love how creamy and flavorful it looks and that there’s no heavy cream in it. Absolute perfection – can’t wait to make it! hi where can I find nutpods please? would safeway carry it? If there isn’t a location near you, they also have a link on their page so you can get them on amazon. And you can always ask your local Whole Foods to start carrying them! This sounds delicious! I love your first dessert cookbook and can’t WAIT for your new meal cookbook to come out! Do you have a release date yet? Made this tonight, was really good! I added a boat load of fresh spinach instead (had some I needed to use!) and saute’d some onion and red bell pepper with the garlic too. Thanks for this recipe, I am definitely making it again! YES!!!!! I have missed creamy things since going vegan and I HATE coconut anything so that is out for me, and so many recipes that are vegan call for canned coconut milk to make it thick and creamy so it’s frustrating for someone who hates coconut. This made me so happy! I am all over this recipe!!! I made this for dinner tonight and it was wonderful. But i used a pound of spaghetti and it was still very saucy. I might have been able to use more pasta. My super picky, pasta loving 13 year old son liked it a lot. I’m so glad I have leftovers for a yummy lunch! My kids love pasta, especially cream-based sauces. This is a great way to offer them a healthier option. I usually make my cream sauces the same way but instead of creamer I add a few pieces of Laughing Cow cheese and Parm. 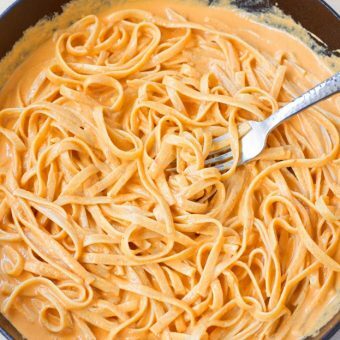 When you add the cooking water from the pasta it metls it, creating a super smooth and creamy sauce! I’ve always loved the way you plated your pasta recipes, and this is no different! 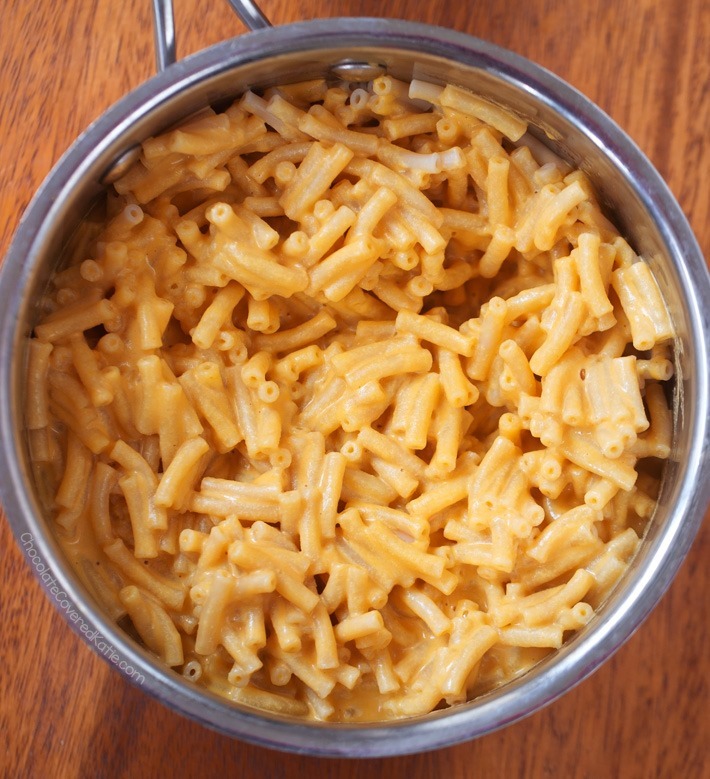 I love this idea of this recipe–the sauce is so creamy and strong in flavors! My fiance made this last night! It was delicious! I’ve been using Nutpods in my coffee for months and hadn’t thought to use it in other recipes. And for the person who asked about where to find Nutpods, it’s not available where I live but it is on Amazon. I really liked this, and I’m definitely saving it to make it again soon! 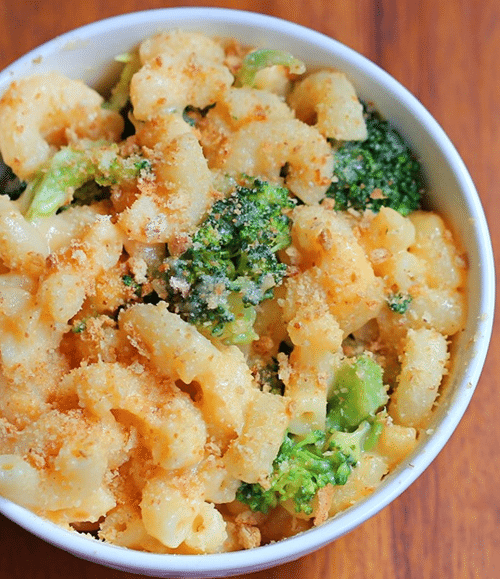 It’s super easy, and the creaminess is to die for — would hardly know it’s vegan. 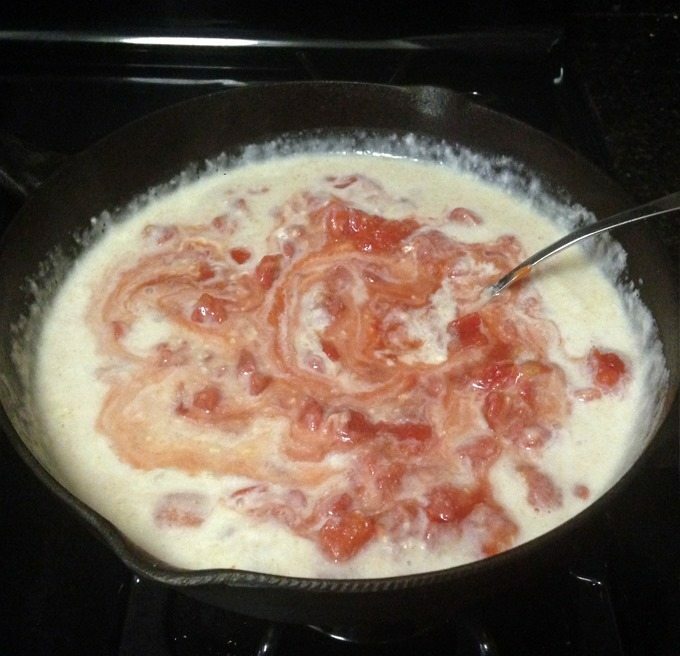 I opted for fresh, chopped Roma tomatoes that I sauteed first before adding them near the end. I think next time I’ll add more nooch or something else for spices — it was a little too simple for me personally, but it would be SO easy to kick it up with a lot of spice variations. Thank you for this! This was extra delicious. My kids loved it and my husband even asked for seconds! We used the Nutpods Original Creamer you recommended, which was very good. I still have to try your cashew cream though!